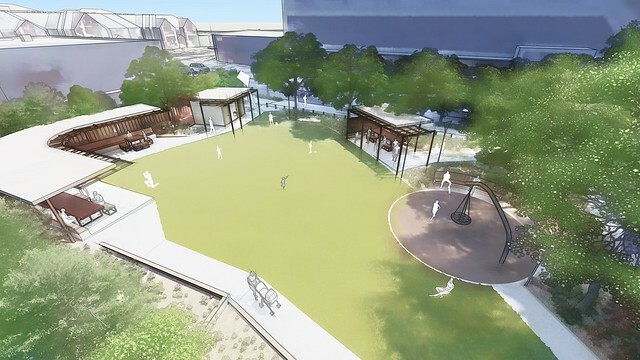 Brisbane City Council advises that construction for a new urban common park in Milton will start in April 2019 and is anticipated to be completed by September 2019, weather permitting. The much-loved inner-city suburb of Milton is evolving into a thriving urban hub for businesses and residents. To support growth in this area, a new urban common park is being built on the corner of Manning Street and Railway Terrace in Milton, adding to the more than 2100 parks across our city. The community submitted feedback on the concept plan in March 2018. The final concept plan is now available to view. Milton Urban Common concept plan (Word - 1.04Mb). Milton Urban Common newsletter - July 2018 (Word - 1Mb). Brisbane City Council is committed to keeping Brisbane clean and green, making our city liveable and sustainable for future generations. The park will be able to be used for all kinds of recreation, from fitness to relaxing with a picnic; with the inclusion of green shady spots to have lunch, feature seating walls, sheltered tables and ample open space for recreational activities. a large area of turf that will allow flexible uses, such as informal play and recreation, and will be framed by planting and feature seating. a new fully accessible toilet block to provide much needed public amenities. increased garden space, reducing the amount of pavement. The park area is located on the corner of Manning Street and Railway Terrace, Milton. The land was acquired by Council in 2014 after the Milton Station neighbourhood plan was developed, and the space is currently a turfed area. The creation of Milton Urban Common will take place in stages. Future stages of works will expand the park area by closing a small section of Manning Street, as detailed in the Milton Station neighbourhood plan. Council will work closely with the community to plan and deliver this work in future years. encourages recreational activity in our wonderful subtropical climate. The Milton Urban Common project is part of Council's commitment to keeping Brisbane clean and green, making our city liveable and sustainable for future generations. Community feedback on the concept plan for the first stage of works was collected via an online survey and information kiosks. The final concept design announced to the community. Works due to be completed in September 2019, weather permitting. View the Milton Urban Common project artist impressions as a slideshow, or view the photos individually as part of Council's Flickr account.